The Court of the Patriarchs is an easily missed stop inside Zion Canyon, yet it is perhaps one of the best spots for landscape photography at Zion National Park. 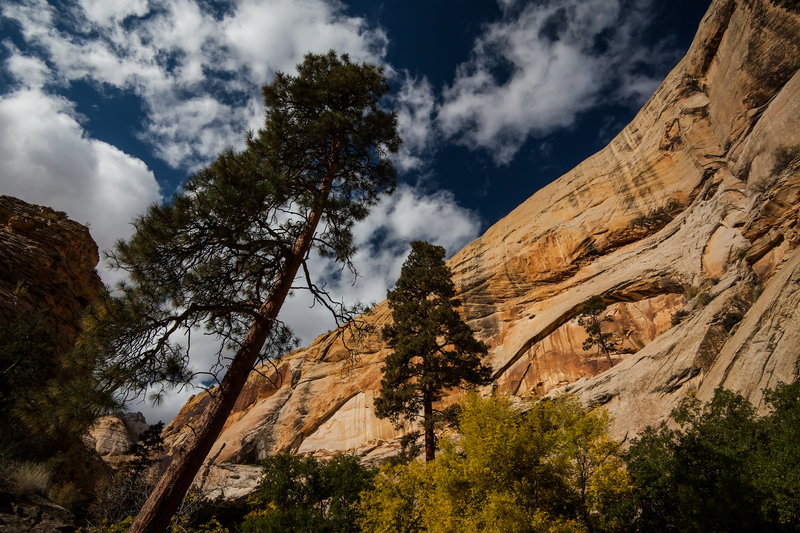 The Court of the Patriarchs is a set of sandstone cliffs towering almost 2,000 feet above Birch Creek Canyon and the valley floor, at the intersection with the Virgin River. The Court offers one of the more amazing photographic opportunities inside the 15 mile-long Zion Canyon, yet can easily be overlooked. ‘The Court’ can be found at stop four on the Zion Canyon shuttle. Looking down Zion Canyon from high above the canyon floor. The cliffs were named in 1916 by Methodist minister Frederick Fischer for biblical figures Abraham, Isaac and Jacob. Also visible from this vantage point are Mount Moroni, and The Sentinel. Both very famous rock formations at Zion. 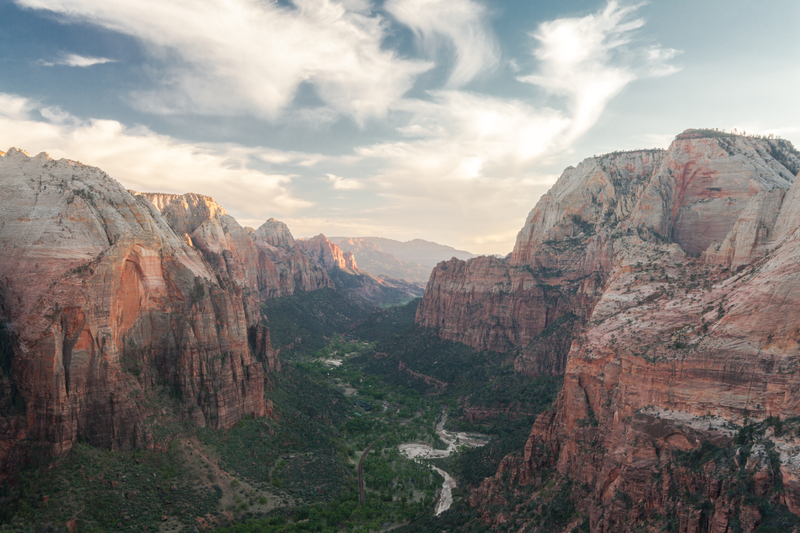 The exposed sandstone that make up the ‘Court’ is one of nine sedimentary rock layers found at Zion National Park that span 150 million years of time. Zion Canyon’s Navajo sandstone walls were once sand dunes in the largest sand desert in the history of our planet. Geologically speaking, the Navajo Sandstone that makes up these cliffs represents what remains from what was the largest known sand desert in the history of our planet! It consists of thick layers of cross-bedded sandstone formed by windblown sand dunes, during early Jurassic time, when the climate of the Colorado Plateau dried significantly, creating desert conditions over a broad region. These cross-beds, which are indicative of the dominant wind direction during the time in which it was a massive sand dune, lead geologists to determine that the sand that makes up this rock formation was brought to its current location many years ago from the northwest. Geologists have looked even more closely at these rocks to determine its origin. Tiny, rare grains of zircon have enabled scientists to determine that at least some of the Navajo sand came from as far away as the ancient Appalachian Mountains, transported across most of North America by ancient rivers, and later blown by desert winds. Think on that for a minute! These towering rock walls were at one time sand dunes in a massive desert, and that sand was before that part of the ancient Appalachian Mountains way out east! Although visible from the Zion Canyon Visitor Center, as well as the top of the short walk technically labelled the “Court of the Patriarchs Trail,” photographers looking for more interesting images will want to access the best vantage point from the banks of the Virgin River, just down the banks through the cottonwood trees from the shuttle stop. As mentioned, technically there is a trail to an overlook of the ‘Court,’ however, it is so short that it is a stretch to call it a “trail.” In fact, its further from the bus stop to the trailhead than from the trailhead to the end of the trail, which is basically a short paved path that gets you up high enough to see over the trees. In morning you can look for soft golden light that should paint the peaks of the ‘Court.’ The Virgin river will be flowing nicely, with the bloom of desert wildflowers during springtime, and excellent colors from the autumn foliage as leaves on the riverside cottonwood trees turn from green to yellow. 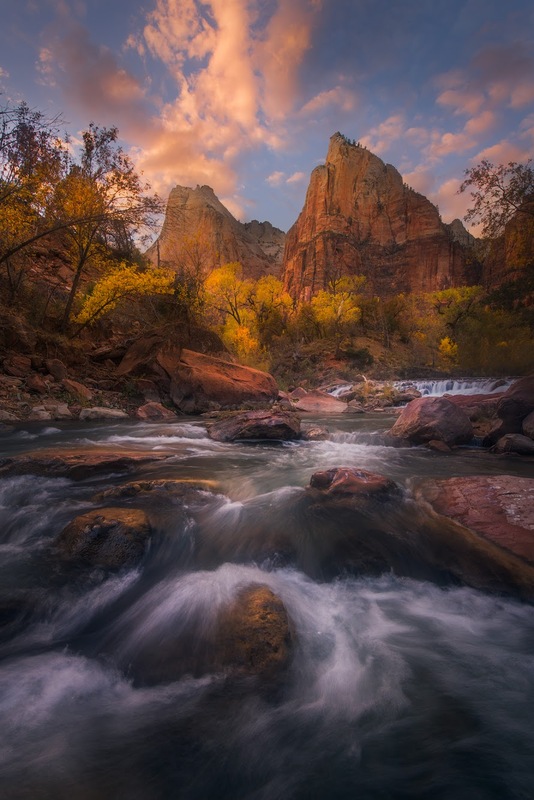 Photographers will most certainly want a wide angle lens, good sturdy tripod, and (ND) filters in order to properly slow down the flowing water of the Virgin River. Look for your own unique compositions while here. 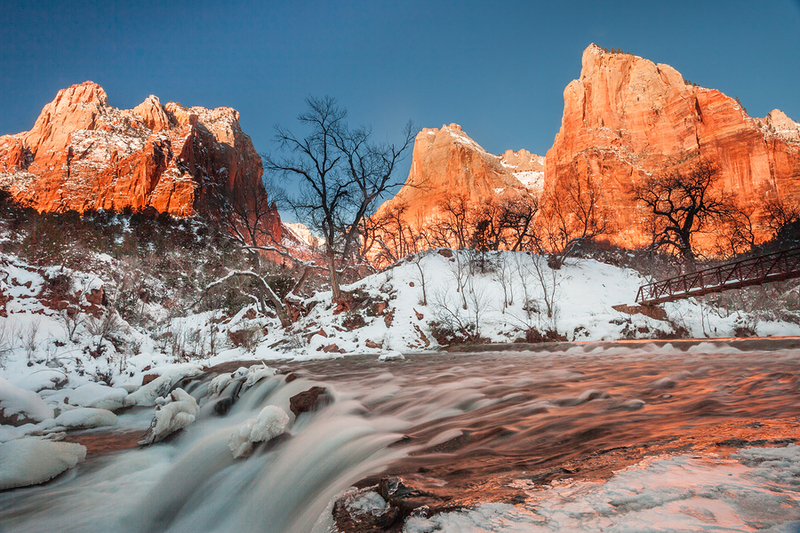 Backcountry Journeys photo guide, Matt Meisenheimer, who is always one to point out that the Court of the Patriarchs is his favorite place to photograph at Zion, was able to make this wonderful photograph on one of his many visits to the Park. 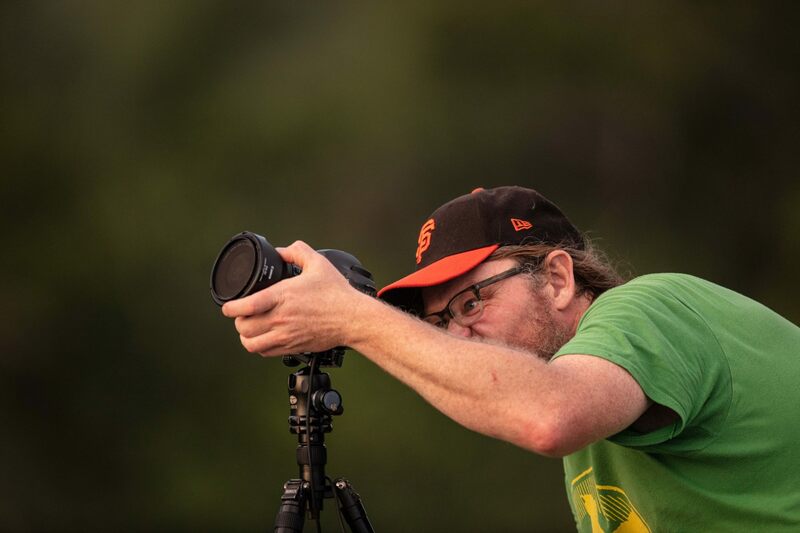 While the Court can be missed as a photographic opportunity, it shouldn’t be. We certainly make sure to stop here while on our Canyons of Utah: Zion & Bryce Canyons Tours that take place in springtime and in autumn. In fact, few coveted spots remain on our ‘standard tour,’ running April 28 – May 3, as well as on our ‘hiker’ version of the trip which is set for May 5 – 10, 2019. Click here to register for this fantastic tour of Zion and Bryce Canyon National Parks before it’s too late!